Cara Delevingne & Moschino Creative Director Jeremy Scott unleash their wild sides in our new film - with an even bigger reveal to come at Cannes. To mark Magnum’s arrival at Cannes and the release of two new indulgent Magnum Double flavors – Double Cookies & Cream and Double Chocolate Hazelnut, we’re ready to unleash our wild side in our most daring collaboration yet. In our latest film, Jeremy Scott, creative director of Moschino, and international film star and supermodel Cara Delevingne unleash their wild side and dare to go double. Moschino presented the perfect partnership for this year’s Unleash Your Wild Side campaign, with the belief that fashion should be bold and fearless. The luxury fashion brand constantly pushes the limits on style and standout pieces are their signature. The mind behind this brand is the daring and audacious Jeremy Scott. Jeremy’s pop style inspired the vision behind the new campaign and helped bring to life a world as iconic and stunning as the Magnum Double itself. When it came to finding the muse of this year’s campaign, there was no question as to who embodied the spirit and attitude of Unleash Your Wild Side and Dare to go Double. Cara Delevingne is loved by her fans for her quirky, fun and bold personality. In both her fashion and film career she dazzles and delights with her unfiltered and authentic style. Together, Cara and Jeremy have created a film that is both fun and fierce. Featured in the film are the new beasts – a few of Moschino’s uniquely crafted illustrations designed and brought to life specifically for the campaign by legendary animator Uli Meyer who is most notable for his work on “Who Framed Roger Rabbit” and “Space Jam”. The beasts will make another appearance as part of the campaign, during a big reveal at the Cannes International Film Festival on May 18th. 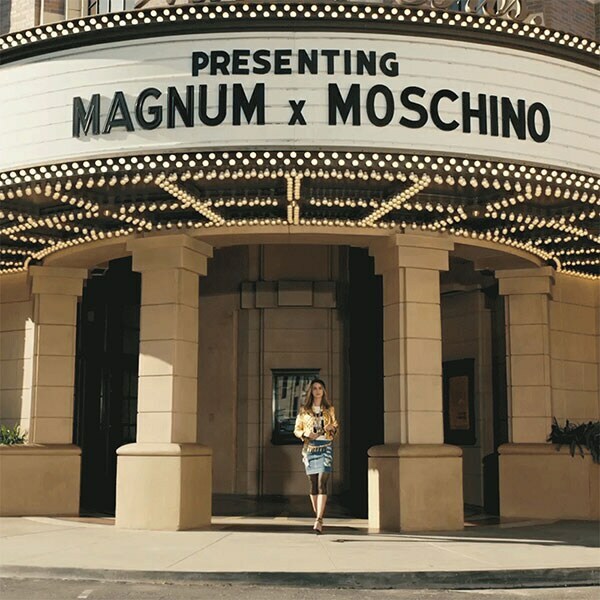 The evening of May 18th will see Magnum and Moschino collaborate yet again to host the hottest and wildest party on the Croisette, giving guests an evening of pure indulgence and pleasure in true Unleash Your Wild Side style. Stay tuned for more details on the A-list attendees and entertainment to come.